The idea of painting all species of North American birds began with John James Audubon in the early 1800s. Other wildlife artists soon followed, embracing his passion and focus. Arthur B. Singer was among one of those artists who perfected the painting skills and technique required to capture, not only the essence of his subjects, but give his art aesthetic appeal based on scientific observation. Influenced by Rungius, Fuertes, and Kuhnert, Singer’s fascination with drawing and painting began when he was a young teenager. 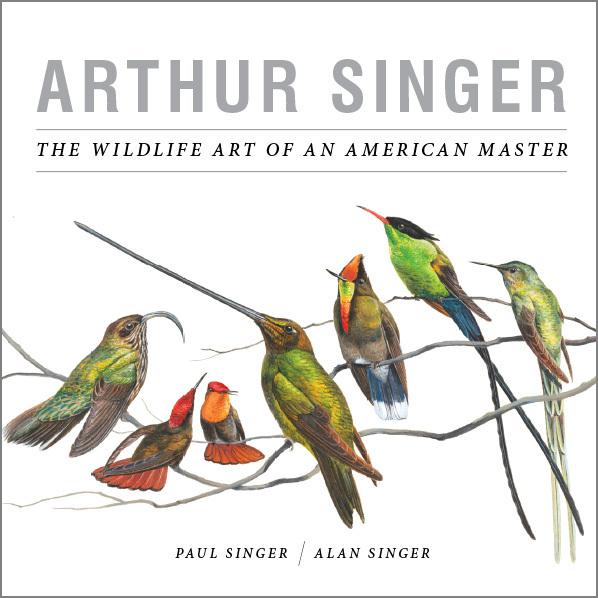 In this first biography, Arthur Singer, The Wildlife Art of an American Master, sons Paul and Alan describe a career of more than forty years, accompanied by vivid color reproductions of his extensive artwork. Included in Singer’s biography are several unpublished works not yet seen by his collectors or fans. Some of these images include sketches of American jazz artists, Cab Calloway, Fats Waller and Duke Ellington, whom he befriended in the late 1930s. 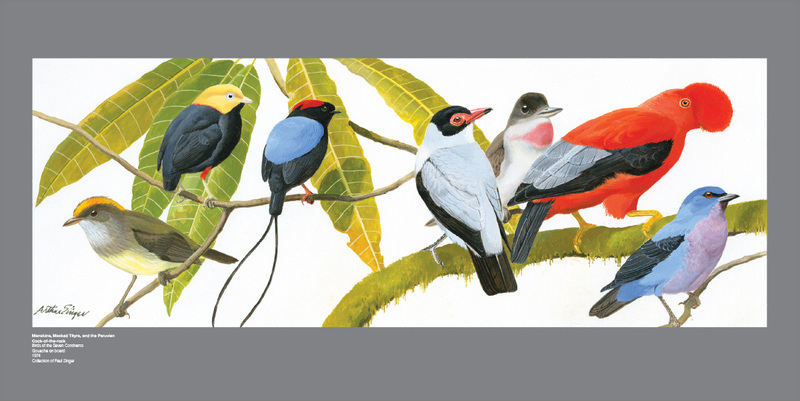 In this book are paintings Singer created while traveling the world or preparing additions to his volumes on ornithology. As a student at the Cooper Union Art School in New York City, Singer experimented with abstractions from nature which fueled his ambition to become a wildlife artist. After graduating from college, his artistic career took a turn in 1944 when he entered the U.S. Army during World War II. His talents were recognized by a general who assigned him to a special unit—the 603rd Camouflage Engineers—whose mission was visual deception against enemy forces. This band of artists were also known as “The Ghost Army” and they created not only camouflage, but visual, sonic, and audio deception to undermine German intelligence. Once his Army obligation had ended, Singer worked briefly for an advertising agency and then became a full-time illustrator and painter in the mid-1950s. He received the Augustus St. Gaudens Medal in 1962, after his bird paintings appeared in the book Birds of the World which sold more than half a million copies. 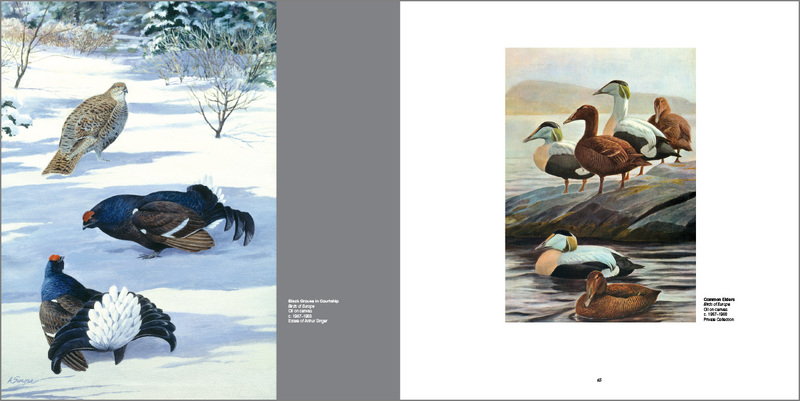 Perhaps he is best known for his paintings of state birds which were seen by millions when the U.S. Postal Service issued the State Birds & Flowers stamps in 1982. Alan Singer assisted his father in creating art for this set of commemorative stamps which became one of the largest selling series in U.S. Postal history. Singer’s talent was honored when he was issued the Hal Borland Award from the National Audubon Society in 1985 upon the 200th anniversary of Audubon’s birth. Since Singer’s death in 1990, his artwork has had several retrospective exhibitions including the New York Zoological Society’s Central Park Zoo Gallery, the Wendell Gilley Museum, the Buffalo Museum of Natural History, Caumsett State Park’s Marshall Field Gallery, The Leigh Yawkey Woodson Art Museum, and the Roger Tory Peterson Institute, among others. 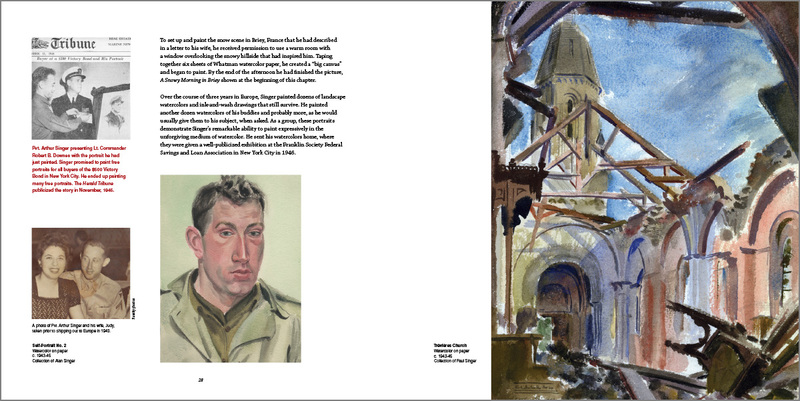 Most recently, Singer’s watercolors painted during his army years have appeared in the documentary and book entitled, The Ghost Army of World War II, which has helped generate a new interest in the artwork of the 603rd Camouflage Unit. Paul Singer is a graduate of the Philadelphia College of Art (1968) with a BFA in graphic design. Interested in nature and the outdoors, he has focused on designs for zoos, museums, and botanic gardens. He has also worked as an interpretive sign designer for the National Park Service, state park systems, and greenways in California, Connecticut, New York, Pennsylvania, and Vermont. 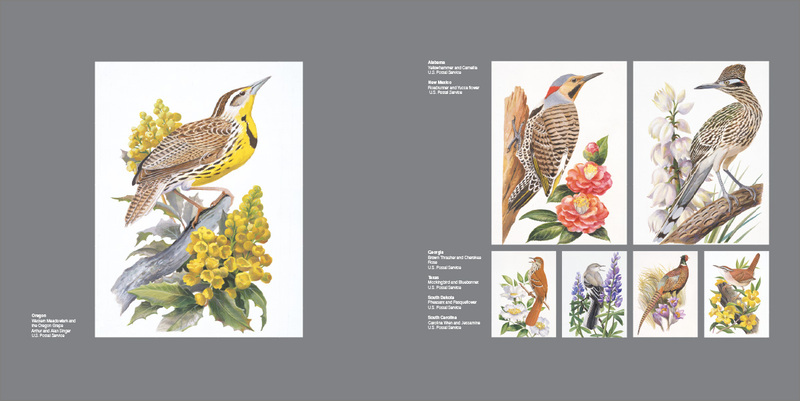 His illustrations are included in The Knopf Nature Guide series for Audubon, The Audubon Master Guides to Birding, The Knopf Collector Guides to American Antiques and other publications. In his leisure time, he paints seascapes, studies history, and collects antiques. Paul and his wife, Janet, reside in Brooklyn, NY. Alan Singer is a graduate of the Cooper Union School of Art with a BFA in Fine Art (1972), and an MFA from Cornell University (1975). 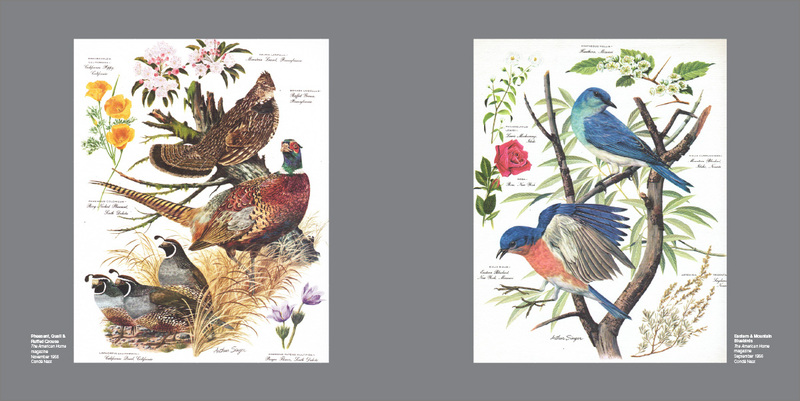 For nine years, Alan worked with his father, Arthur, on revisions to both of Singer’s field guides to birds, and helped illustrate the State Bird & Flower Stamps for the Postal Service. Alan illustrated the State Bird & Flower first day covers for Unicover Corp. Alan has also illustrated books which include The Total Book of Houseplants and State Birds. Since 1988, he has been an art educator and professor at Rochester Institute of Technology. 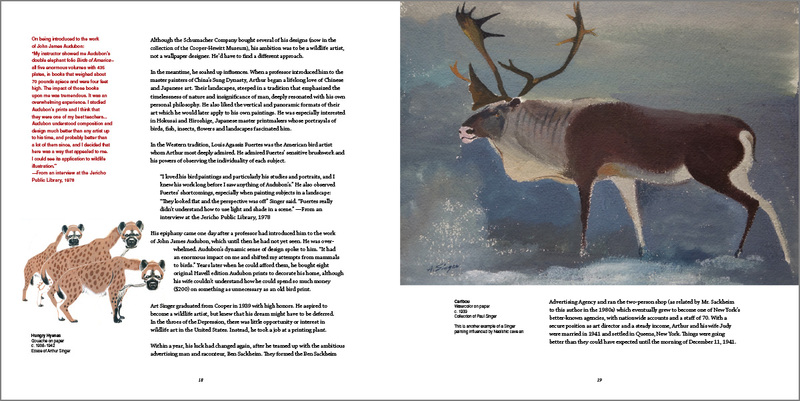 A painter, printmaker, and author, he has had 27 solo exhibitions and blogs at The Visual Artworker. Alan and his wife, Anna, reside in Rochester, New York. An exhibition, "Arthur Singer: The Wildlife Art of an American Master" will be on view at RIT University Gallery: August 7—October 28, 2017. Size: 11 x 11 in. "After I graduated from high school in 1971, I had the opportunity to go to the Asa Wright Nature Center & Lodge in Trinidad for a drawing and painting workshop led by Arthur Singer (illustrator of many books including the ground- breaking Golden Guide, Birds of North America) that so many of us used in the 1970s). It was a fantastic experience, immersed in birds and painting for two weeks." 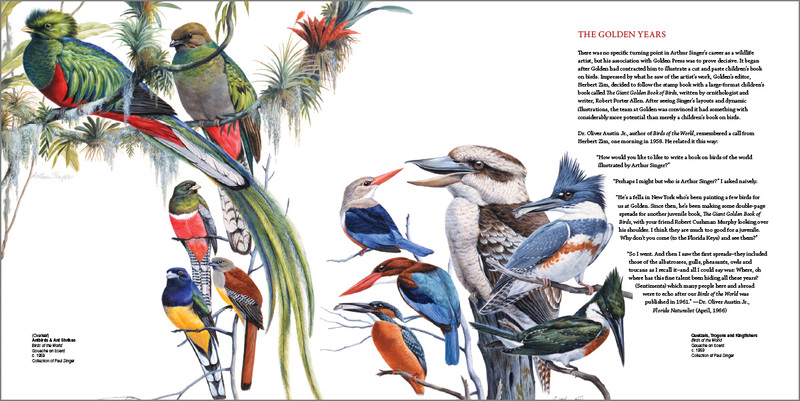 "Growing up in the New York suburbs during the 1960s, one of my treasured possessions was my Golden Press edition of Birds of the World illustrated by Arthur Singer. Singer’s birds are not only alive . 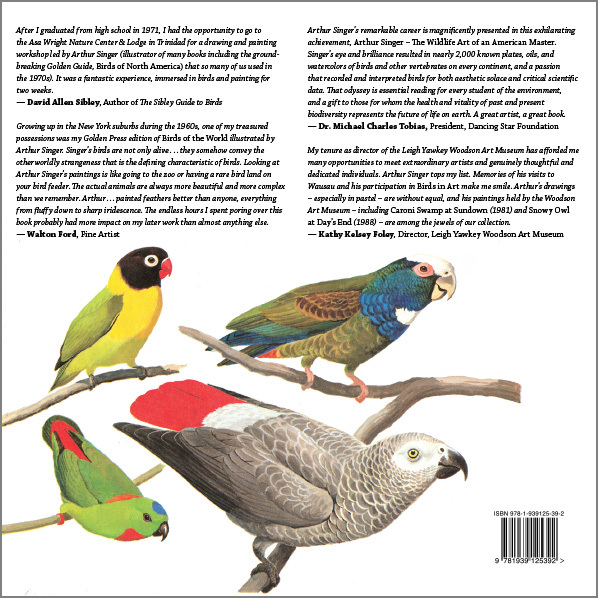 . . they somehow convey the otherworldly strangeness that is the defining characteristic of birds. Looking at Arthur Singer’s paintings is like going to the zoo or having a rare bird land on your bird feeder. The actual animals are always more beautiful and more complex than we remember. Arthur . . . painted feathers better than anyone, everything from fluffy down to sharp iridescence. The endless hours I spent poring over this book probably had more impact on my later work than almost anything else." 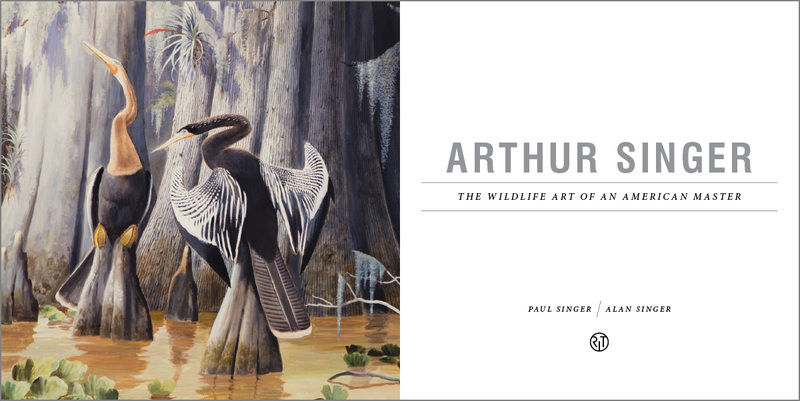 "Arthur Singer’s remarkable career is magnificently presented in this exhilarating achievement, Arthur Singer – The Wildlife Art of an American Master. Singer’s eye and brilliance resulted in nearly 2,000 known plates, oils, and watercolors of birds and other vertebrates on every continent, and a passion that recorded and interpreted birds for both aesthetic solace and critical scientific data. 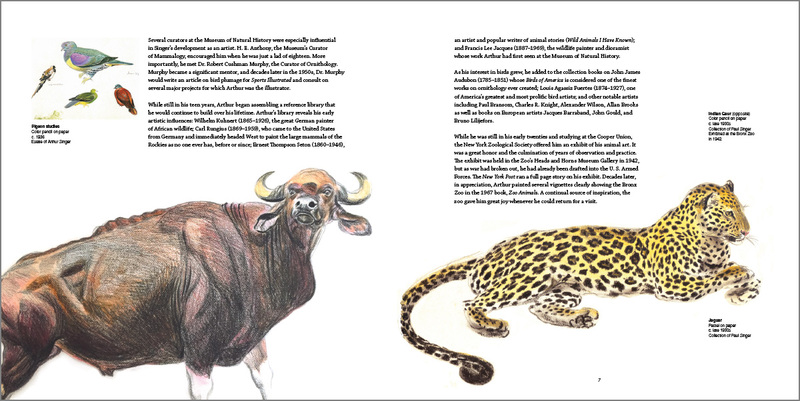 That odyssey is essential reading for every student of the environment, and a gift to those for whom the health and vitality of past and present biodiversity represents the future of life on earth. A great artist, a great book." "My tenure as director of the Leigh Yawkey Woodson Art Museum has afforded me many opportunities to meet extraordinary artists and genuinely thoughtful and dedicated individuals. Arthur Singer tops my list. Memories of his visits to Wausau and his participation in Birds in Art make me smile. Arthur’s drawings – especially in pastel – are without equal, and his paintings held by the Woodson Art Museum – including Caroni Swamp at Sundown (1981) and Snowy Owl at Day’s End (1988) – are among the jewels of our collection."